The juiciest and most flavorful of all steaks, the rib-eye is actually the center-most part of a delicious prime rib roast (or the “eye of the roast”). The rib-eye steak has excellent marbling, giving it loads of flavor and providing just enough fat needed to help it stay tender during cooking. The majority of Chefs agree that a succulent rib-eye steak is best grilled and served medium rare, but it can still be tender if grilled to medium. Diner’s choice, of course. SpiritLine Dinner Cruises’ popular Entrée, the Rib-Eye Steak is cooked to order on a wood-fired grill. The delicious Entrée included seasonal vegetables and a roast sweet potato puree. 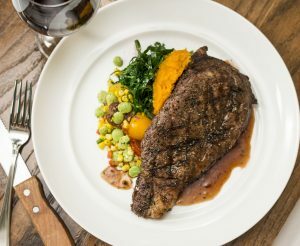 Following an appetizer of traditional Charleston she-crab soup and a fresh, seasonal house salad, the Rib-Eye Steak Entrée is simply delicious. Pair with one of the wines from SpiritLine Cruises extensive selection or domestic, imported, and local beers, if preferred. 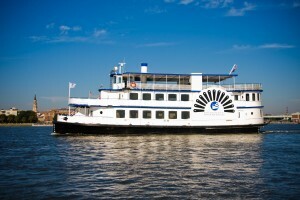 The Spirit of Carolina is the beautiful vessel hosting SpiritLine Cruises’ Dinner Cruise. Built and designed to comfortably accommodate large groups for dining, the boat offers two large enclosed air-conditioned, beautifully decorated, dining decks and an open-air observation deck. Additional amenities include 10 foot ceilings, atrium windows, mezzanine level dining on the lower deck, and two mahogany hand-crafted bars. The Spirit of Carolina has a fully equipped galley to serve the needs of Executive Chef, Shawn Eustace and Head Sous Chef. Chef Eustace fell in love with SpiritLine Cruises immediately and has remained throughout the years, delivering excellence for the Dining Guests. Chef Eustace has been key in shaping SpiritLine Dinner Cruise’s transformation into one of Charleston’s finest culinary destinations. Shawn attended Trident Technical College’s Culinary School, where he was able to explore in depth different cuisines with a focus on Southern dishes. 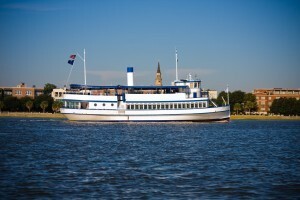 SpiritLine Cruises offers the only true waterfront dining experience in Charleston. Aboard the Spirit of Carolina, Dining Guests will enjoy a three or four course dinner, made to order from local seasonal ingredients. While dining, the Spirit of Carolina cruises through beautiful Charleston Harbor, past Fort Sumter, along the Battery and beneath the Ravenel Bridge. Sunset views are amazing. Full service bar available and Live Music enhances the experience. SpiritLine Cruises Dinner Cruise is worthy of the most memorable occasions! Plan your next Corporate Event! Enjoyable + Productive can be the two main ‘take-aways’ from planning a Corporate Event aboard SpiritLine Cruises of historic Charleston, South Carolina’s Spirit of the Lowcountry! Corporate Event guests coming aboard the Spirit of the Lowcountry’s Tour Boat for a Harbor Cruise will be treated to the completed installation of a state-of-the-art Audio/Visual system. The top notch Audio/Visual system is custom designed by Gattis Professional Audio for SpiritLine Cruises ~ Charleston’s Premier Cruise Fleet. The Sound System includes powerful even coverage and excellent fidelity resonating from state-of-the art Amplifiers and Speakers. The system will “wow” Attendees with the sound quality necessary for DJ-level Entertainment plus the clarity of Audio Mixers. The speaker system will also be used for basic paging and passenger information disseminated from the Wheel House and the Bridge of the Boat. This high-resolution speaker system includes multiple levels and zones of clear sound coverage for all deck areas. High-power, weatherproof speakers are used on the Performance Deck near the “Stage” area. Presenters or Performers will have state-of-the-art head sets and the sound quality will be excellent throughout all decks of the vessel. 2 Sharp 55” TV Sets will be visible from the inside decks. These visual displays provide a best-in-class, interactive experience and Virtual Narration. Should your Company explore hosting a Corporate Event aboard a SpiritLine Yacht, your company’s Event Coordinator will be paired with a highly professional team whose standards for excellence over the last 52 years of experience will match those of the most exacting Management Teams. Combine an Executive Chef & Executive Cruise Director and viewing Charleston from her historic Harbor- your group’s dining experience will be second to none. SpiritLine Cruises’ Corporate Event Planners can provide assistance with menu selection, bar options, décor, entertainment and audio-visual services. Highly experienced planners will work closely with your Event Coordinator to make sure your Company’s vision of the Event is detailed to perfection. The famous Southern dish, ‘Shrimp & Grits’ was actually ‘born’ in Chapel Hill, North Carolina. Back in 1982, Chef Bill Neal, of ‘Crook’s Corner’ restaurant changed the status of the humble ingredients by infusing the grits with cheddar and parmesan cheeses, as base. The Jumbo Shrimp topping the delicious base also included mushrooms, bacon and other ingredients. Food Critic Craig Claiborne of ‘The New York Times’ sampled the dish in 1985 and history was made! From that time forward, ‘Shrimp & Grits’ was appearing as an entrée in fine dining establishments including in famous ‘foodie’ city, Charleston, South Carolina. 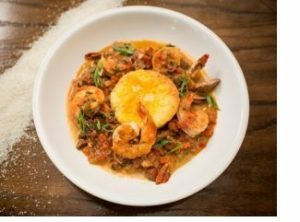 From North Carolina spreading to Charleston, South Carolina throughout the South to Cajun spicy New Orleans, the now-famous dish ‘Shrimp & Grits’ becomes customized with local ingredients. Visitors can sample several versions at the annual Shrimp & Grits Festival in Jekyll Island, Georgia. Or, try famous Southern food writer, Nathalie Dupree’s Cookbook dedicated to the many versatile styles of this one delicious dish. Historic Charleston, South Carolina has been serving the delightful dish for generations. Privileged families gracing Charleston’s downtown mansions loved seeing the main course served to be creamy ‘Shrimp & Grits’. Corn based meal, or grits, are stone-ground, mashed hominy. Native American and white people communicated in the latter part of the 16th century by exchanging grits when they had no common language. Fast forward to 1976 and grits were declared the official state food of South Carolina. Toppings along with the fresh shrimp can include mushrooms, garlic or a variety of local spices, vegetables such as green, red or yellow bell pepper, bacon and andouille sausage. Sauce ranges from tomato-based to deep brown gravy. Hanna Raskin, Food Editor, reviews 5 Southern Restaurant’s versions of ‘Shrimp & Grits’ in ‘Garden & Gun’ Magazine’s, April 11, 2018 article – Google It! All are yummy! SpiritLine Cruises ~ Charleston’s Premier Cruise Fleet is owned and operated by a local Charleston family with generations of Maritime Heritage. SpiritLine Cruises is the ONLY Harbor Tour company operating in Charleston that offers guests Live Narration by a Licensed City Tour Guide. SpiritLine Cruises employs only dedicated professionals who complete rigorous, comprehensive training and exams. SpiritLine Cruise’s knowledgeable and entertaining Tour Guides are licensed by the City of Charleston. Most Tour Guides are Charleston natives who have grown up surrounded by the area’s vibrant history, waterways and many have been with the company over 10 years. SpiritLine Cruise’s Tour Guides are happy to answer questions and so knowledgeable it will be hard to ‘stump’ them…Guests leave the Harbor Tour enriched with both maritime and cultural experiences. Embark on a Charleston Harbor Tour from one of two memorable departure points – downtown Aquarium Wharf dock or from Mt. Pleasant’s Patriots Point permanently docking USS Yorktown. Guests and their traveling companions will board a 90-minute Tour narrated by licensed Tour Guides, with salty breezes, gentle waves and passing memorable sites like Shutes Folly Island and Castle Pinckney in the middle of the Harbor, Patriots Point, Fort Moultrie and Fort Sumter while seeing Charleston’s rooftops from waterside. Playful dolphin often accompany the boat. Cruising Charleston’s historic harbor is not a site soon forgotten! Restrooms and Snack Bar available onboard. Ice cold beer available for purchase. Guest’s comfort and enjoyment are SpiritLine Cruises top priority. Guests enjoy cruising in the new climate-controlled Main deck or feeling the Charleston breezes on the Observation Deck. SpiritLine Cruises’ Charleston Harbor Tour is a great first stop for new guests, explore Charleston, South Carolina. A perfect introduction to this historic, port city.